Greetings from the MSDS Fort Cumberland team! 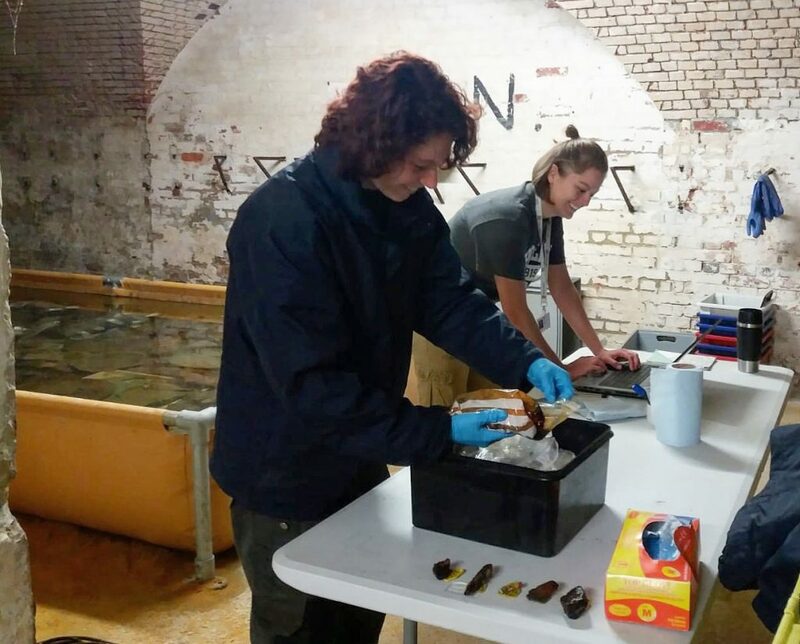 Over the last few months, Nicole (Archaeologist- Finds) and I have been busy at work on all things Rooswijk – Open Day tours, condition assessments, and the big move to the Fort! 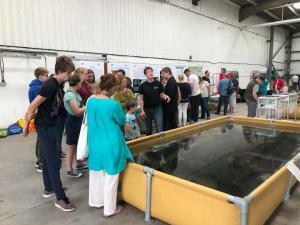 After completing the second #Rooswijk1740 excavation season this summer, the project team held the first of our Open Days in Ramsgate in August where specialists were on hand to talk conservation, archaeology, zooarchaeology, archaeobotany, material science, and photogrammetry related to this season’s excavation. This was our first opportunity to share new discoveries from the 2018 season, and we loved meeting so many excited visitors interested in the project! The event also gave us a chance to demo the site’s virtual dive trail which is scheduled to be released soon. Conservation Manager Angela Middleton shows guests the storage tank with waterlogged timber excavated during the 2018 season. Following the Open Days, Nicole and I got straight to work packaging the finds in preparation for their transport to Historic England’s conservation laboratory at Fort Cumberland in Portsmouth. When packaging artefacts for transport, it’s most important to protect against physical damage and to keep the wet artefacts from drying out. 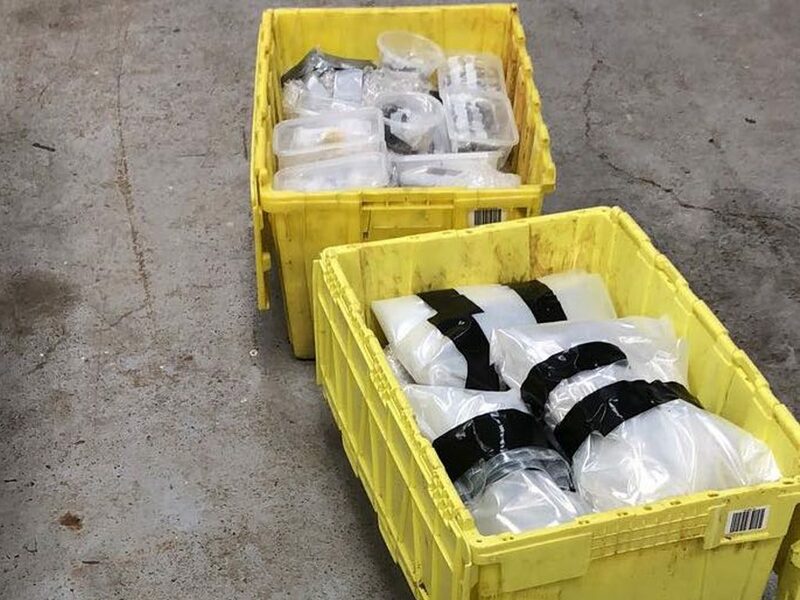 To achieve this, the smaller artefacts were either packaged individually in small containers with water or wrapped in wet capillary matting (an absorbent synthetic material) and plastic to keep them damp during the journey. These artefacts were then transported in a van back to Fort Cumberland. The large artefacts, such as the waterlogged timbers, and concreted barrels presented a slightly different logistical challenge. 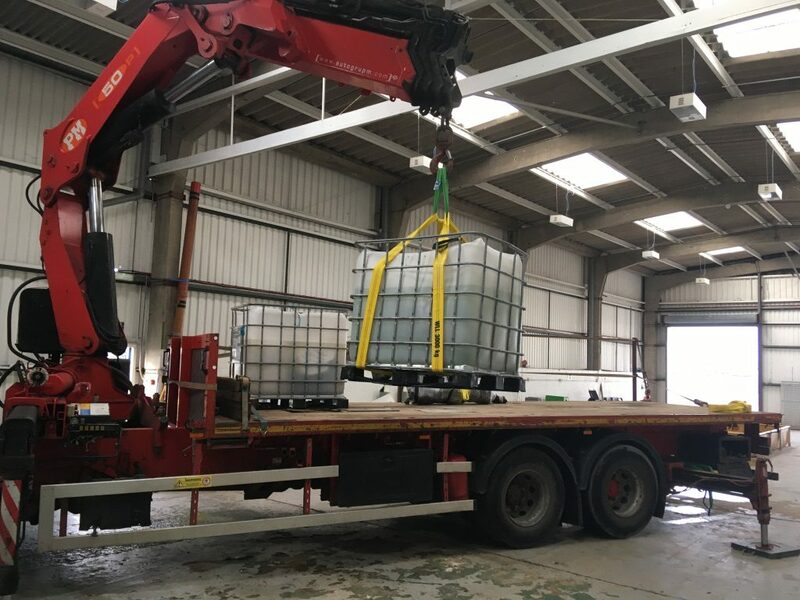 In most cases, heavy lifting equipment is required, and it may not always be practical to transport them in water due to their size and the weight of water required to submerge them. 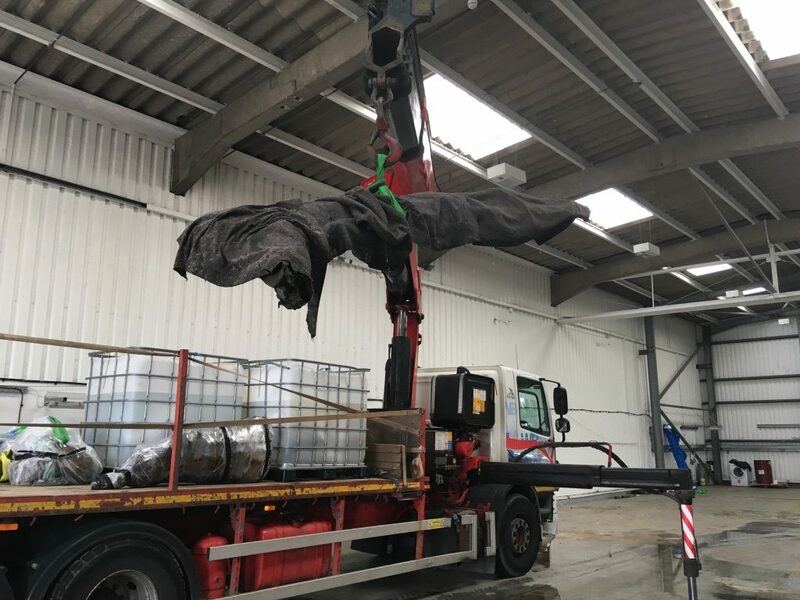 In this case, the 3 large artefacts – two concreted barrels and one copper alloy pot – were able to be lifted in their respective storage containers (approximately 1 m3) by a crane straight onto the lorry for transport. Then, all of the timbers were wrapped in capillary matting and lifted onto the lorry as well. Finally, everything was ready for transport to Fort Cumberland! See the timbers being unloaded here. A waterlogged timber (the knee of the ship) is loaded onto the lorry. So now that the artefacts are all safely in wet storage at Fort Cumberland, what’s next for Nicole and me? Well, we now have the task of assessing and recording the 355 artefacts and 17 timbers excavated this year before any conservation treatment can begin! As part of the assessment and recording, we will be analysing most of the artefacts, especially those obscured by marine concretions, with X-radiography (X-ray). This information will help us to make treatment decisions when we have a better idea of the possible composition and stability of artefacts inside. 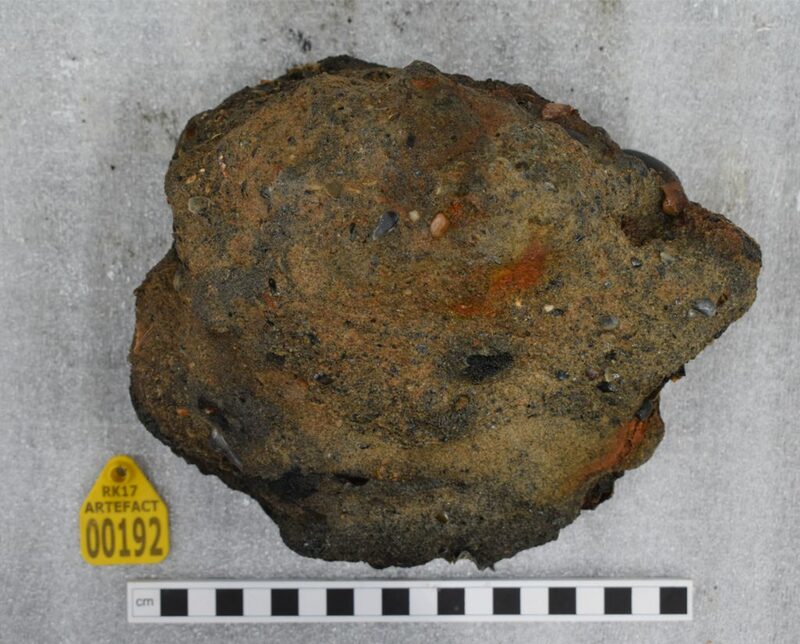 An example of this can be seen with concretion RK17 A00192 which appeared to contain an iron cannon ball and lead musket ball when the artefact was analysed with X-ray. We will also record some finds with a structured light scanned (SLS) and photogrammetry. These 3D models will be available to view on our Sketchfab. Nicole and Kim recording and assessing material from the 2018 excavation season. RK17 A00192 concretion after excavation. 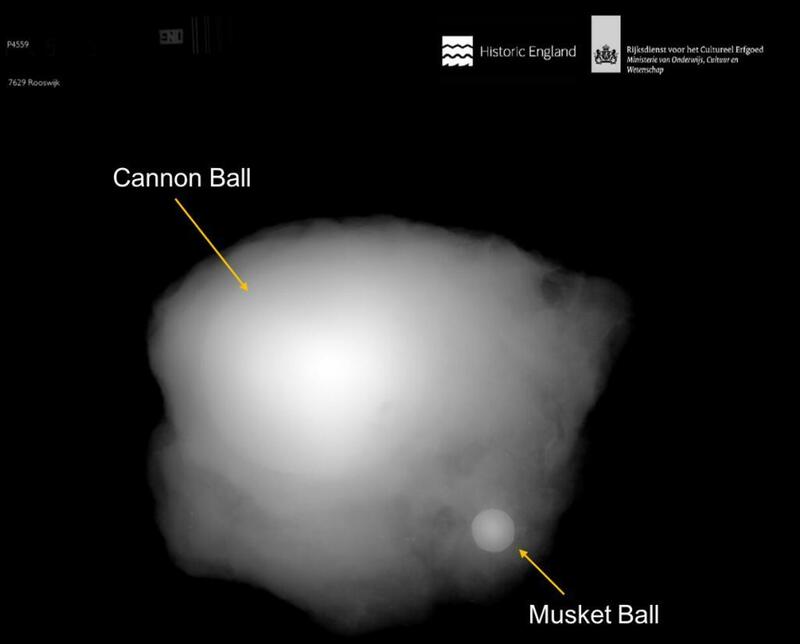 X-ray of RK17 00192 showing an iron cannon ball and lead musket ball. Stay tuned for more updates from our Fort Cumberland team as we continue post-excavation analysis and begin treating the artefacts! You can catch up with us at our next Open Day at Fort Cumberland, Portsmouth on 11 November at Fort Cumberland or at the annual Nautical Archaeology Society (NAS) Conference on 17-18 November in Newport. The Rooswijk was a Dutch East India Company vessel which sank on the treacherous Goodwin Sands, off Kent, in January 1740. The ship was outward-bound for Batavia (modern-day Jakarta) with trade goods. The site is now protected by the Protection of Wrecks Act 1973 and all access is controlled by a licensing system administered by Historic England on behalf of the Department for Digital, Culture, Media and Sport. The ship’s remains lie at a depth of some 25 metres and are owned by the Dutch Government. The UK government is responsible for managing shipwrecks in British waters, therefore both countries work closely together to manage and protect the wreck site. The Maritime Programme of the Cultural Heritage Agency of the Netherlands (on behalf of the Ministry of Education, Science and Culture) and Historic England (on behalf of the Department of Digital, Culture, Media and Sport) are responsible for the joint management of the Rooswijk.